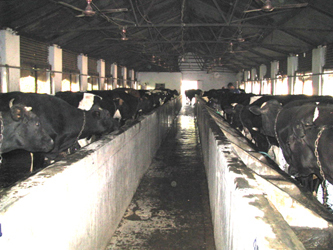 (Left) Sarada Dham. 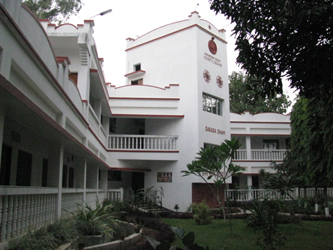 The guest dormitory where Manick Sorcar with his wife Shikha and the group stayed during the tour at Deoghar. 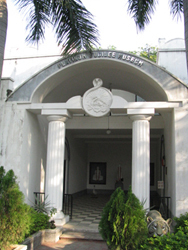 (Right) Entrance to the Vivekananda Auditorium. 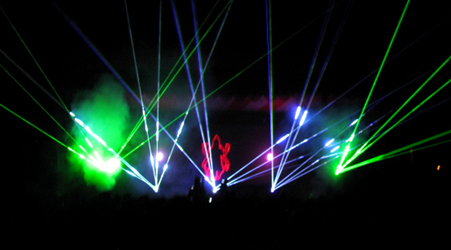 The auditorium and the stage were strikingly beautiful , but unfortunately, they were not large enough for the laser documentary show. 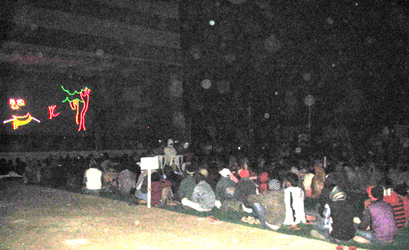 Under the banner of Ramakrishna Mission Vidyapith of Deoghar, Jharkand, “Swamiji” was displayed outdoors at the Vidyapith campus on a custom-made, temporary stage , built to the specific requirements of the world... touring Manick Sorcar laser show. Attended by around 3000 spectators, which included the invited dignitaries, students, teachers, devotees, visitors, press reporters and media , the show stole the hearts of Deoghar as they had “never experienced anything like this before”. While the students sat on spread sheets on ground and the dignitaries were seated at the back, thousands stood on the sides awaiting the show. The dignitaries included ex-minister Shri Krishnananda Jha, District Mayor Shri Sanjayand Jha, and Bharatshri Kamal Bhandari. (Left) A 50’W x 36’D x 20’H temporary stage for the event was custom-built for the event. 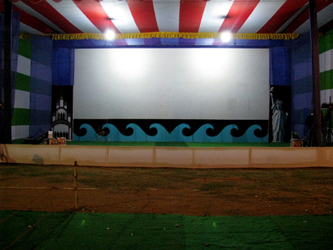 Sorcar’s 36’W x 14’H laser screen had a scene of Dashineswar Kali Temple on the left, Statue of Liberty on the right – with waves of ocean adjoining the East and the West. (Right) Students sat on spread sheets on ground, many with blankets wrapped around their body to dare the cold temperature of winter. The program started with the introductory notes by Shri Ram Sevak Gunjan, the principal of Red Rose School. Manick Sorcar, his wife Shikha, and the group were felicitated with bouquets of flowers and gifts by Swami Sarvagananda, Head of the Ramakrishna Mission Vidyapith. Sarvagananda ji introduced Manick formally to the audience, and requested Shri Ram Sevak Gunjan to be the interpreter to translate Manick’s speech in English to Hindi, the native tongue of the people of Deoghar. 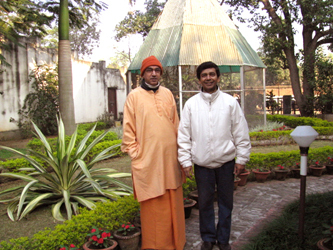 (Left) A scene from “Swamiji”, as the portrayed of Lord Narayana appears on screen. 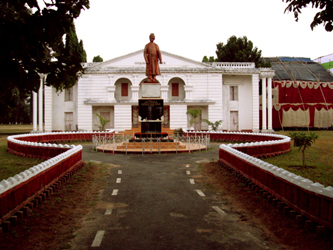 (Right) Narendra starts seeing hallucination as he is touched by Ramakrishna. But when Manick surprised the audience by speaking in Hindi, he was welcomed with a wave of roaring applause. When he said “You have to forgive me if my Hindi is not perfect… I will need the interpreter’s assistance to explain it to you better”, his line was buried halfway under the roaring crowd who demanded Manick to continue to speak on his own. As scheduled, the show started with “Vandana”, the laser-live prayer-dance based on a song written by Swami Vivekananda, followed by “Swamiji” the one-hour laser documentary. The rest became history. People rushed to congratulate Manick and the team with statements like “what a thrilling experience”, “we have seen use of lasers in the Olympic and Asian games, but never for a documentary and on stage the way you have”, “Very research oriented”, and “loved how you captured his whole life in a one-hour documentary”. The popular Hindi newspapers gave rave reviews and coverage of the event with color pictures. 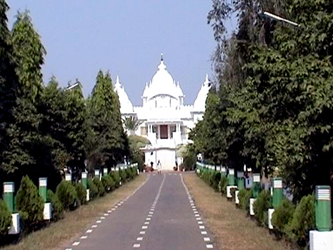 The congratulatory comments from people continued as Manick Sorcar and the group travelled to see the rest of the beautiful Ramakrishna Mission Vidyapith campus the next day. (Note: Read comments from viewers in Manick's facebook.